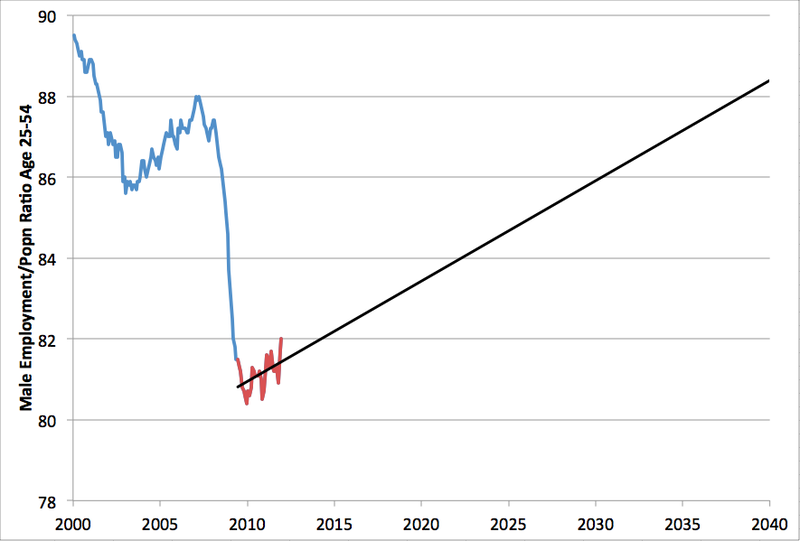 What is overwhelmingly more likely is that the ratio will not recover to the pre-recession level before a new shock arrives and knocks it lower yet. I continue to be amazed that this data - together with its causes and implications - are not at the center of our economic-political discussions. The importance of hard work and self-discipline has been a central value of western culture for many centuries (if not millenia). One in five working age men are no longer working (or not in any way that society is able to measure at least) and as far as I can see there is little or no hope of a fundamental reversion in this trend. We are going to have to either a) change the situation in the economy, or b) undergo a massive values shift to give honor and meaning to men who don't work, or c) experience a major crisis. Thanks Stuart: This post is representative of why I check Early Warning frequently. I understand the political difficulties with doing it, combined with the effect of your economic competitors not doing it. But why not cut the hours in the work week? It wasn't that long ago (50's say) when you would see magazine articles predicting a 32 or 24 hour work week. It's also struck me that our system is set up to give power to employers (duh). Decoupling health care from employment is also a good move for many, many reasons. We are going to see a lot more people made redundant by technology, so why not cut the work week? is part of this trend due to more two income families compared to the past? What does the graph for women look like? Maybe ther are some men staying home to raise the family while the wife works. As a non-worker (living off capital income) I can say that work has become a sucker's game. Work is basically that which is done by the debtors of society; particularly those who have gotten into debt to buy the two things society hard-sells, a college degree (not to be confused with an 'education') and a house (not be confused with a speculative investment). Both are sold as showing some sort of social standing, but in reality, are just tools of the social institutions to bring people into a mild form of debt-slavery, or indentured servitude. Especially student loan debt, with the non-dischargeable nature of it and the constant selling of it as 'essential'. Honestly, it makes me a bit queasy when I hear parents and teachers selling the idea of 100k of debt for a 'degree' being worth it; it stopped being worth it a long time ago and only continues to be worth it because of government largess. It may be that men, more than women (who tend to, IM(very controversial)O, be more socially swayed) have figured this game out and stopped playing. It could also be that the jobs that are growing (in health care, private sector education and government contracting) are more female centric. Work for the sake of work, especially in a society that demeans large swathes of workers (ie "Do you want fries with that" used as an insult) is not a social order that is sensible either. "The importance of hard work and self-discipline has been a central value of western culture for many centuries (if not millenia)." I think this is the heart of the issue in that I don't think that this is really any more than a myth we tell ourselves now. The actions, at least of society as a whole, pretty clearly indicate that the focus of our value judgement has shifted from this idea of hard work (trying) to that of money/wealth ("success"). Or, put another way, we no longer care much about the means, only the ends. Unless we get your (b), I see no change. Unfortunately, I don't think that is likely to happen without (c). I see several contributing factors to this trend. One, as 'unknown' raised above, is the changing role of women in the workplace, more two income families - see Elizabeth Warren's talk on "The coming collapse of the middle class". Another, perhaps less on the radar, is that the US is the leading incarcerator of its citizenry, and those are mostly male... Also, of course, is the decline in available net energy to 'run society' or 'grow the economy' or pick your phrasing. We are in decline, headed toward collapse. So of course there is less work out there. Then there are a few like Bordoe and myself who have stepped off the train (albeit perhaps in different ways) before it jumps the tracks. "I continue to be amazed that this data [is] not at the center of our economic-political discussions." Why amazed? We have a system which reliably represents the interests of each dollar equally. Lopsided distribution of assets => lopsided distribution of political power. To paraphrase Stalin's snark about the Pope: "Working people? How many billions do they have?" I'd like to reply to both the commenter bordoe and your post. First, bordoe, I think you're on to something but as many collegebashers you go over the top. College is probably not worth it for most people in America, considering that you pay enormous amounts for even very mediocre schools and the stats show that 45-50 % don't even learn critical thinking by the time they graduate. This may be a sign of that too many are going into college who shouldn't be there. In my country, however, college is free. And I am going to a school which isn't on the radar, because it is very niched towards the natural sciences and I am learning in a small class of 12 people subjects like geology, energy and soil/water management as well as a lot of biochemistry and other subjects which would help me if I wanted to work with food issues. I'll graduate debt free unless anything extreme happens and although a college degree is no guarantee today, people who graduated from my college have an average unemployment rate of 1.7 % and this was measured in the thick of the crisis and the work they measure isn't unqualified work. So I would say that your comments are over the top, but that doesn't mean it's false. It does hold some truth depending on what country you're talking about, what college and student as well as what they pay for what they get. 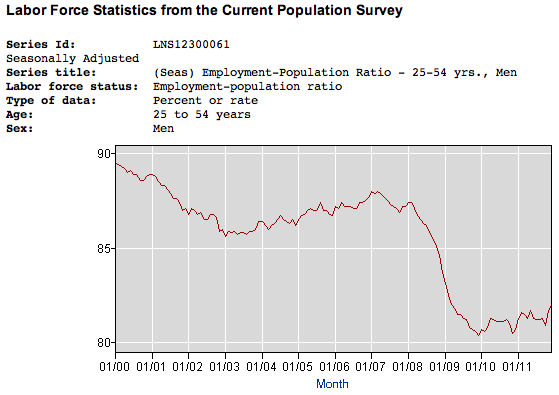 I'd look at the labor participation rate, together with the civilian employment/population ratio. 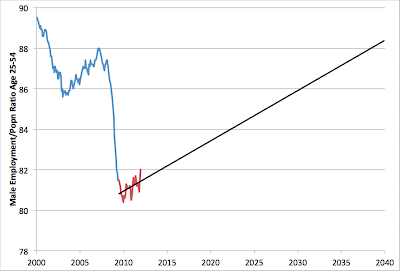 Unemployment for the U-3 definition(which still leave a ton of people out) would be at 11 % solid if the labor participation rate would be at the same place where it was in January 2009 when Obama took office. America is becomming a society where fewer and fewer people work. And since the safety net of America has been that it's a land where it is easy to find jobs, if that disappears then we will see a country which is either more brutal with higher and higher unequality or we'll see the transformation of the society to somekind of backwater European, indebted welfare state where more and more people are living on the dole. The only problem is that aside from Italy and Greece, the U.S. has more debt than almost any other European country. Also, even Italy runs a primary budget surplus, while the U.S. runs a deficit of 10 % per annum. America is in bad shape, and printing money helps but it can only get you so far. And we haven't even touched on technology etc. This decade will be one huge grind for most people in this world, especially the OECD for the first time since WWII. >First, bordoe, I think you're on to something but as many collegebashers you go over the top. College is probably not worth it for most people in America, considering that you pay enormous amounts for even very mediocre schools and the stats show that 45-50 % don't even learn critical thinking by the time they graduate. I am not a 'collegebasher' no more than I was a 'housebasher' during that bubble, or a Nasdaq basher during that bubble. It is about price and means of financing; when those make sense, the training that college provides can be worth it. College certainly provided me with good training to be an accountant, but training is not a synonym of education. >In my country, however, college is free. College is not free, no matter what country you are in; what you mean is that college is state financed. A model I agree with in fact; I think it is nearly criminal to put the young in heavy debt for life. It creates a terrible social problem, but since it benefits certain power structures, it is kept. >America is becomming a society where fewer and fewer people work. We need to define our terms; what you mean is that fewer people are in the wage-labor market. People will find something to do, no matter what, whether that is wage-labor or not. We may well be witnessing the corporate wage-labor system shrinking quite a bit. At the same time, we have had growth of government wage-labor, and near government wage-labor. Witness the massive increase in certain non-traded sectors like health care and schools. To me, these sectors growing are even less desirable than simply them not laboring. >The only problem is that aside from Italy and Greece, the U.S. has more debt than almost any other European country. Also, even Italy runs a primary budget surplus, while the U.S. runs a deficit of 10 % per annum. Debt is an abstract concept, it is only real because governments recognize its reality. There is an excellent book called "The State Theory of Money" (by Georg Knapp) on this topic. Look at Japan today, or Great Britain circa 1890; you'll see that as long as people believe, it continues. The problem is not so much debt, or deficits as such. It is interest expense, which adds nothing to productivity. It is what the debt accomplishes, also dubious in this instance. Stuart, could you point me towards the last graph source url? 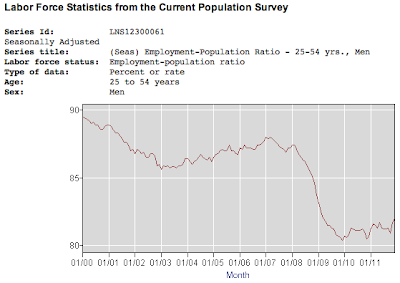 I would like to see how that compares with a graph that includes (the same age group) women as well, to rule out that this represents men losing jobs to women. and then go down to the section on 'CPS Databases' and then click on the top 'One-Screen Data Search' section which will allow you to select various combinations of gender, education, age etc. In general there has been a century-long shift of women moving into the workforce instead of staying home to look after the kids/home. I tend to think that this makes the overall gender neutral E/P ratio hard to interpret since it's the sum of several very different things happening. It's possible that in part some of the trend in the male E/P ratio is that certain men are more able to stay home and be financially supported by their partners. 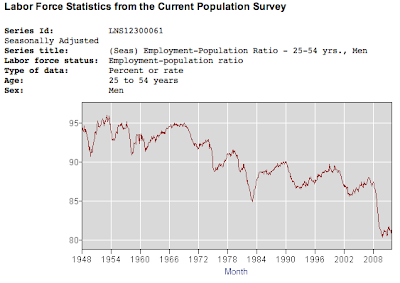 However, given the detailed pattern of where the male E/P is lowest - uneducated men, young men, black men - it seems to me that the biggest driver must be that the economy cannot provide jobs doing things that disadvantaged men used to do (various forms of manual/unskilled/semi-skilled labor) due to some combination of automation and globalization rather than competition with women (who have been more apt to go into administrative/service jobs).